The battle line between the main contenders in next year's general elections was finally drawn yesterday as former Vice President Atiku Abubakar emerged as the standard bearer of the opposition Peoples Democratic Party (PDP). Tambuwal had been tipped to win the primaries, as a result of backing from River State Governor Nyesom Wike and others. But a decision by Atiku's team to book hotels in advance for delegates was a clincher that also gave the aspirant easy access to voters. The Guardian learnt that the aspirants financially induced some of the delegates. Those from Rivers State were specially barred from receiving tips from Atiku's camp. They were reportedly directed to vote for Tambuwal who polled 100 per cent vote from the state. Wike was said to have informed his colleagues that the reason behind his support for his Sokoto State counterpart was that the caliphate would make crucial inputs in the process of weaving other emirs for a groundswell of support in the north for Tambuwal to defeat the candidate of All Progressives Congress (APC), President Muhammadu Buhari in next year's poll. Those who argue that the entrance of the Senate President dimmed Tambuwal's chances, claim that Saraki's 317 votes would have naturally gone to the Sokoto State governor, adding that Tambuwal's 693 and Saraki's 317 would have put the ticket beyond Atiku. Yet it was also said that Saraki's 317 vote haul was due to his late entry to the race coupled with frequent distractions orchestrated by the Presidency and the ruling party that did not want a Saraki on the presidential ballot to compete with Buhari for the crucial Southwest votes in the general election. Retired generals from the north threw their support behind Atiku, ostensibly to ensure that the caliphate did not become so powerful as Wike wanted. An added advantage was Atiku's experience in the management of delegates and presidential elections, which his political groupings like Peoples Front of Nigeria and Peoples Democratic Movement have been doing from the 1990s, which culminated in the trouncing of PSP group to seize the then Social Democratic Party (SDP). In his acceptance speech, he described the primaries as the most credible and transparent since the country returned to democratic rule. He lauded all the aspirants for placing unity, purpose and commitment to the party and Nigerians above individual interests. He declared his readiness to work with them towards victory at the general elections. "We cannot afford to fail Nigerians at this very historic moment because they are yearning for the return of the PDP to power. They know that under PDP they had years of prosperity, unity, security and development. They have seen the gross mismanagement of the APC government. Therefore, we have a wonderful opportunity to return the PDP to power in this country." In a peace overture, he also addressed his fierce critic, saying: "On a personal note, I wouldn't have been standing where I am standing today if my former boss, President Olusegun Obasanjo, had not made me his vice president. Under his tutelage, I learnt quite a lot and I believe the experience I got is going to definitely impact on how we govern this country. I wish to pay my personal tribute to him." Obasanjo had said he would not back Atiku, swearing: "God will never forgive me, if I do." High-level consultation and political horse-trading seemed to have forced the PDP to defer the nomination of its vice presidential candidate. INEC in an election time-table published earlier this year had made it compulsory for all political parties to submit the names of persons nominated for elective offices not later than October 7. But checks by The Guardian showed that though the ticket for the office of president and vice president is supposed to be a joint affair, the opposition party is not yet ready to announce a nominee. PDP's National Publicity Secretary Kola Ologbondiyan confirmed in a telephone interview that the party would take advantage of provisions in the Electoral Act that allow the submission of only the president's name and that of his vice president at a later date. Atiku's emergence, however, has elicited mixed reactions. The Yoruba socio-cultural group, Afenifere, indicated its willingness to back Atiku, given the aspirant's stance on restructuring. "He came to us and promised that he was going to restructure the country. And we have already said that anybody who wants to restructure with all seriousness, such will be our candidate," said Secretary General Bashorun Seinde Arogbofa. He added: "Now that he is in, Afenifere will still decide. Whenever we make a statement, we don't recant. We stand by whatever we do." But a chieftain of the National Democratic Coalition (NADECO), Dr. Amos Akingba, warned that nothing would change with an Atiku presidency unless the country embraces true federalism. "The problem is not with the candidate but the current arrangement of the Nigerian constitution, which is like putting square pegs in round holes. It cannot work. A unitary constitution cannot favour anybody. Whether Buhari or Atiku, neither of them can really do much. Nine out of 10 of those that go into public office do so with good intentions. But when they get there, the constitution does not allow them to really do much," Akingba said. The Southern and Middle Belt Leaders Forum, on its part, congratulated Atiku. In a message, spokesmen of the forum, Mr. Yinka Odumakin (Southwest); Senator Bassey Henshaw (South South); Prof. Chigozie Ogbu (Southeast) and Dr. Isuwa Dogo (Middle Belt) said Atiku's candidacy is a breath of fresh air to Nigeria's democratic project. The forum stressed it is never too early to remind Atiku of his commitment to restructuring. "It is clear today that no amount of good governance programmes can get Nigeria out of the woods without a proper structure that can restore it to productivity under a true federalism," it said, urging INEC to stand up for credible elections. Apex Igbo socio-cultural organisation, Ohanaeze Ndigbo, also congratulated Atiku. Its president general, Chief Nnia Nwodo, who spoke through his media adviser, Chief Emeka Attamah, wished the former vice president a "fair contest" in the forthcoming polls. But the national chairman of the United Progressives Party (UPP), Chief Chekwas Okorie, said he foresees a keen contest, stressing that that it would not be an easy game for the PDP and APC. Although he congratulated Atiku, he nevertheless regretted that the future of the Igbo has been placed in the hands of two people of northern extraction. "The two have track records of who they are. And like a leopard, they cannot change overnight. Now, the battle line is drawn. But it also means that the alignment of political forces will continue until the end of the election," he said. Sounding cautious, he noted: "The game has shifted to the Independent National Electoral Commission (INEC). And at the end of the day, they could be used to make or mar the election process. The attention of the entire world will now focus on Nigeria. We are watching with keen interest." 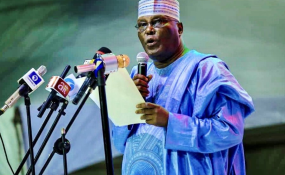 The Arewa Youths For Development and Progress (AYFDAP) said Atiku's emergence is a good omen, given what it described as his antecedent as a dogged politician who has contributed to the development of industry and education. "Buhari should be ready to face an uphill task in the 2019 elections. That is why we are asking for free and fair polls. Nigeria has suffered poverty, crisis and violence. We, the northern youths, believe that with the coming of Atiku as the presidential candidate of the PDP, Nigeria will experience revival in all facets of the economy," said AYFDAP president, Danjuma Sarki. The South East Revival Group (SERG) in a statement by its national coordinator, Chief Willy Ezugwu, said: "For the first time in recent years, the PDP seems to have got it right by its choice of a presidential candidate, a man who believes in restructuring. SERG urges him to bring to the table his comprehensive plan for south east development in line with his restructuring agenda." A Kano-based public affairs analyst, Dr. Abati Bako, was restrained. According to him, Atiku's chances of winning the presidency are "very" slim "because of the critical factor of power of incumbency. Of course, in democracy anything can happen. After all, we saw what happened in the U.S. during the election that brought in President Trump. But this is Africa with a peculiar system." The vice chairman (South South) of the APC, Prince Hilliard Eta, said Buhari would easily defeat Atiku at the polls. He argued: "With Atiku, we now know that Buhari will be the president after the 2019 poll. I am sure Nigerians would not want to go back to Egypt after crossing the Red Sea. Nigerians know the worth of Buhari. I am sure they won't think twice before casting their votes for him." Meanwhile, wife of the president, Mrs. Aisha Buhari, condemned the APC primaries held in parts of the country, citing irregularities, impunity and unfairness. Her brother, Mahmood Halilu, who was defeated at the governorship primary in Adamawa State, has called for a cancellation, saying the exercise was fraught with irregularities. "It is disheartening to note that some aspirants used their hard-earned money to purchase nomination forms, got screened, cleared and campaigned vigorously, yet found their names omitted on election day," she said on her Twitter account. In a veiled reference to Oshiomhole, she said: "All Progressives Congress is a party whose cardinal principle is change and is headed by a comrade/activist whose main concern is for the common man, yet, such impunity could take place under its watch. Given this development, one will not hesitate but dissociate from such unfairness, be neutral and speak for the voiceless. It is important for the populace to rise against impunity and for voters to demand that aspirants be committed to the provision of basic amenities." But in a statement yesterday, President Buhari, through his spokesman, Garba Shehu, urged losers in the primaries to demonstrate sportsmanship by accepting defeat without bitterness. "We shouldn't lose hope permanently because tomorrow could present another opportunity for us to contest again and win," he said.